Ted, or as the name is usually printed "ted", should not be confused with Teddy Ruxpin. Oh boy, not in the least bit. You ain't taking your kids to see this and when it eventually comes out on DVD, you will be sending your kids off to grandma's before loading this baby up. And now from the screwball mind of one Seth MacFarlane, best known as the creator of the animated TV comedy series Family Guy, comes a little boy's fantasy come true. Yes, his best friend, a stuffed teddy bear, comes to life after a magical wish is granted. The twist on the plot is that this story is about the little boy all grown up. We get to watch a 35 year old man and a potty mouthed teddy bear act like a couple of frat boys swilling beer, smoking pot out of a bong, and swearing like a couple of stevedores. Did I mention swearing? Ha ha, when was the last time you pulled the string on your stuffed animal and a stream of four letter words came out? Surprising enough, the premise would have seemed like a one trick pony but the movie manages to sustain your interest and the laughs for its nearly 2 hour running time. Okay, this may not be the funniest film I've ever seen but I certainly enjoyed it and a foul mouthed teddy bear does give MacFarlane licence for some locker room humor that otherwise might have come across as lame. Oh, and by the way, this is not for kids; this is strictly for adults. Okay, for the low-brow humor of the teenager in all of us. Starring Mark Wahlberg and Mila Kunis with Seth MacFarlane voicing the bear, we have the story of a grown man needing to grow up to get the girl and to develop a new relationship with his childhood buddy. This is the framework for a series of Animal House-like gags and it's low brow humor but with a talking teddy bear, isn't that original? Since this is a fairy tale, well kind of a fairy tale, we need narration and what better voice to use than the lofty sounding Shakespearean type voice of Patrick Stewart. The trailer captures very well the premise of the movie, the contrast between the young boy getting his wish to come true then the 35 year old man, er, kid, behaving like he's never grown up at all. This is an amusing film. This is low brow humor but it does manage to keep its pace for the entire movie unlike other films built on a single premise. Even Roger Ebert was pleasantly surprised and accorded it three and a half stars out of four. High praise indeed. Once again, this is strictly for adults. For heavens sake, do not let your kids watch this. Years ago, I made the mistake of gushing about the movie Pulp Fiction to some friends with young children. I unfortunately failed to stress that the content of the film is strictly for adults. My friends rented the film and sat down with the whole family to watch it. I think it's the ten minute mark when you hit your first instance of the MF word and from there it just goes downhill. Ha ha. My friend ripped the DVD out of the machine and nobody ever watched the rest of the film. 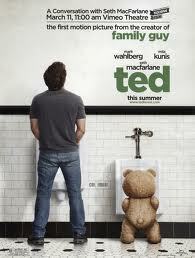 Do not, I repeat, do not watch Ted with young children. Ted: quite an amusing 2 hours with some laugh out loud moments. Ted (stylized as ted) is a 2012 American comedy film, directed, co-written and produced by Seth MacFarlane and starring himself, Mark Wahlberg and Mila Kunis. The supporting cast includes Giovanni Ribisi, Jessica Stroup, and Patrick Warburton. The film is the feature-length directorial debut of MacFarlane, produced by Media Rights Capital, and distributed by Universal Pictures. Teddy Ruxpin is a children's toy talking bear. The bear would move his mouth and eyes while 'reading' stories which were played on an audio tape cassette deck built into his back. It was created by Ken Forsse with later assistance by Larry Larsen and John Davies. Later versions would use a digital cartridge in place of a cassette. At the peak of his popularity, Teddy Ruxpin became the best-selling toy of 1985 and 1986, and the newest version was awarded the 2006 Animated Interactive Plush Toy of the Year by Creative Child Magazine. A cartoon based on the characters debuted in 1987. Surprised by how much I laughed my pants off during this because I’m not a huge fan of Family Guy, but somehow, a lot of the humor just clicked for me. MacFarlane is definitely a director to watch when it comes to making R-rated comedies. Nice review William.